We are a leading Manufacturer of dosing pumps from Bengaluru, India. With an aim to stand tall on the expectations of our esteemed clients, we are providing Dosing Pumps. The offered pumps are manufactured by our adroit professionals using the finest quality components and progressive technology in adherence with industry norms. 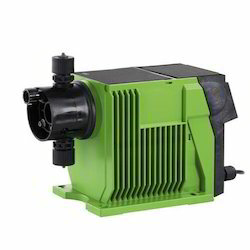 Our clients can avail these pumps from us in variegated specifications and dimensions at budget friendly prices. Moreover, these pumps are highly praised in the market for their different quality measures.